The most significant approach to emerge in the last decade for a more efficient, cost-saving way to improve clinical trial monitoring is risk-based monitoring (RBM). This approach has been widely encouraged by regulatory agencies and is gathering momentum in adoption by sponsors and CROs. 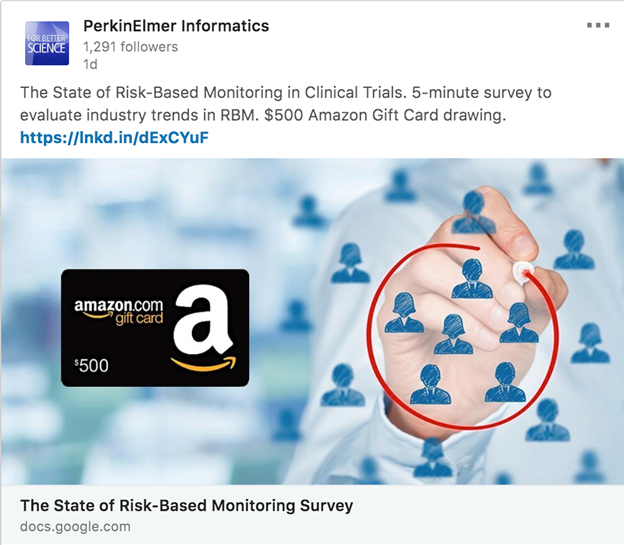 Proponents of RBM projects believe that the investment in this approach will return an overall reduction in monitoring expense by 15 to 20 percent.1 This paper discusses RBM as a high-value use case that can be enhanced by a robust clinical data aggregation and analytics solution. For many years, most approaches to clinical trial monitoring have relied heavily on 100 percent source document verification (SDV) and other on-site monitoring functions to ensure the safety of study participants and the integrity of study data. However, SDV is a very time and resource intensive practice, requiring clinical research associates (CRAs) to check every data point on the information reported by investigators against source records to ensure data accuracy and validity. In addition, SDV is applied uniformly throughout a trial rather than proportionate to the risks. RBM calls for targeted monitoring to reduce the amount of SDV, based on risk assessment to identify core critical data supporting trial endpoints and patient safety. The extent of monitoring vacillates based on key risk indicators (KRIs) and data trends during the trial. Following a risk assessment, resources are allocated across a study based on data criticality, patient safety, data integrity, protocol compliance, and the impact to operational delivery. For effective RBM, the first fundamental step is full integration of the vast amounts of data coming from many different sources and systems, which must take place before data analysis can begin. At the end of the day, program, country and study managers must be able to model and set trial budgets based on fixed and variable budget components and achieve trial milestones. Unfortunately, information on budgets and milestones is typically not readily available and easily accessible. With nearly 80 percent of clinical trials failing to meet enrollment timelines3 and significant delays across many programs, proper oversight of clinical development operations is imperative. Clinical operations managers and CRAs struggle with visibility into trial progression at global sites, issue detection, and slow, cumbersome reporting methods. More data sources than ever before contribute to the clinical trial budget, creating complex, time-consuming and multifaceted financial management. With the increase of outsourcing, data from multiple vendors and contracts end up in disparate systems, and the lack of integration prevents the data from being easily used for accurate, efficient financial management. Data from multiple systems must be pulled and analyzed in cumbersome Excel worksheets. Given the recent ICH GCP E6 R2 guidance, total responsibility of trial oversight, including CRO outsourced trials, are now the sole responsibility of the Sponsor. While a good first step, outsourcing only cuts costs and drives efficiency so much. The burden then gets shifted to the CROs who are starting to turn to RBM as a solution to streamline their internal operations and cut their costs. Figure 1. 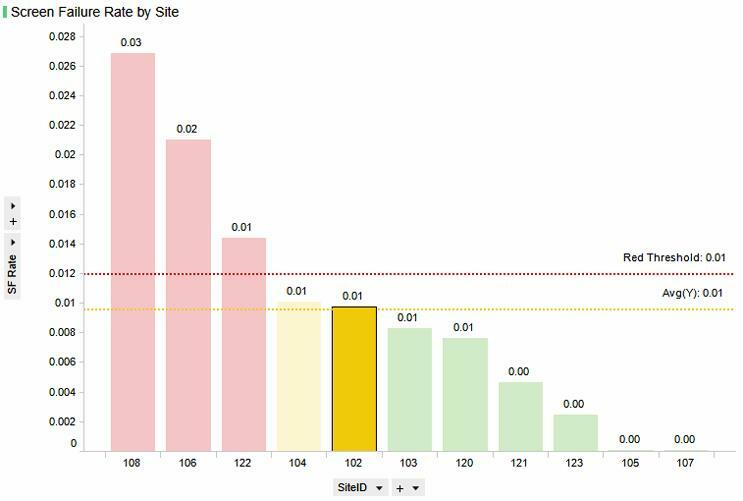 Category-level risk indicators by site. Sites can be selected to view the KRI roll-up to category and overall levels. Figure 2. Screen failure ratio by site, adjusted for months in study. This is dependent on upper management support to build RBM into protocol designs and propagate this new methodology throughout the organization to gain acceptance and alignment. The solution must leverage flexible technology to process and aggregate the data. The technology must be flexible enough to load data from any application, database, line listing, file or report. Users must be able to learn from previous mappings to reduce manual work as use of the system expands. Patient data in the CDISC SDTM (study data tabulation model) format and clinical operations data into ODM (operational data model) format must be compatible. Full data integration is needed to drive platform agnostic dashboards and analytics. The Risk Assessment and Categorization Tool (RACT) was originally developed by TransCelerate to identify and assess risks, which in alignment with critical data/processes, direct the level of intervention when monitoring sites. KRIs, therapeutic and study-specific risk templates, and mitigation steps are then integrated. The RACT was designed to identify how and by which functions the risks will be managed; document risk mitigations; categorize individual risks as high, medium, or low; and provide guidance to determine the baseline of monitoring activities, including suggestions for SDV. After defining critical data and processes, study-specific key risk indicators (KRIs) are created and defined, with thresholds designed to trigger an action, such as increased data scrutiny. Alerts can be delivered by email or text with a link in the system to the issue as thresholds are reached based on KRIs such as: safety, investigational product, recruitment, discontinuation, issue management, data quality, on-site workload, essential documents, staffing, facilities and supplies. Custom KRIs can be created based on the study or therapeutic area or geographic requirements of the study, and end users should be able to adjust the risk weighting throughout the study. For example, since enrollment is less important in later stages of the study, it should have a low risk weight at that stage. KRIs, associated thresholds, and actions are documented in an integrated quality and risk management plan (IQRMP). Advanced technology with powerful visualization capabilities enables study teams to efficiently incorporate KRIs into the study management process. The RBM system should also have an oversight risk score dashboard, show KRI weight controls, include historical risk score trends, and display risk score compared to monitoring rates. And, an effective RBM solution should be part of a closedloop Quality by Design (QbD) approach that supports adaptive monitoring through action and feedback mechanisms that capture historic site performance data for future site selection decisions. Most importantly, the tool should be embedded into an overall clinical operations tracking and analytics strategy to ensure seamless interaction and decision-flow between other operational functions such as resource planning, trial portfolio management, budget planning, QbD, as well as safety and outcomes monitoring environments. Recently, a number of niche vendor solutions have entered the market that are disconnected from existing decision support systems in clinical operations, which prevent the most positive gain on trial efficiency. As RBM evolves, we are seeing that in order to effectively implement RBM, there are ties to other business functions within an organization that need to be aligned as well as upper management support and acceptance of RBM within the clinical operations ranks. From a baseline technology perspective, solid data integration and analytics are at the foundation of any successful RBM solution.